Celebrate Studio Ghibli’s ‘Only Yesterday’ — Featuring Daisy Ridley and Ashley Eckstein — with Her Universe and Hot Topic! CELEBRATE STUDIO GHIBLI’S ‘ONLY YESTERDAY’ WITH HER UNIVERSE AND HOT TOPIC! 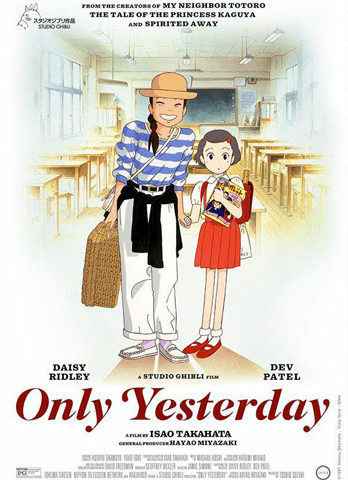 Studio Ghibli’s celebrated 1991 film Only Yesterday, directed by Isao Takahata, is being re-released in select markets for the first time in the United States February 26th with an all-new English-language voice cast which includes Daisy Ridley, Dev Patel and Ashley Eckstein. Her Universe and Hot Topic are celebrating the re-release of the film’s 25th anniversary this year with a special limited edition Only Yesterday t-shirt exclusively to HotTopic.com which can be ordered here – http://www.hottopic.com/search?q=Only+Yesterday. Her Universe and Hot Topic have teamed up to offer fans exclusive merchandise from Studio Ghibli films such as My Neighbor Totoro, Kiki’s Delivery Service and Spirited Away. To shop Studio Ghibli merchandise, visit www.hottopic.com. Visit Her Universe via Coffee With Kenobi here. Thank you to Her Universe for the press release. Previous article How Did C-3PO Get His Red Arm?! Your First Look at STAR WARS SPECIAL: C-3PO #1!